October | 2012 | Relaxed. Transitioning. Natural. Beautiful. This blog post contains affiliate links (e.g., to Amazon, eBay, etc. ), which means that if you click on one of the product links and place an order, I’ll receive a small commission. This helps support my blog and allows me to continue to create content like this. 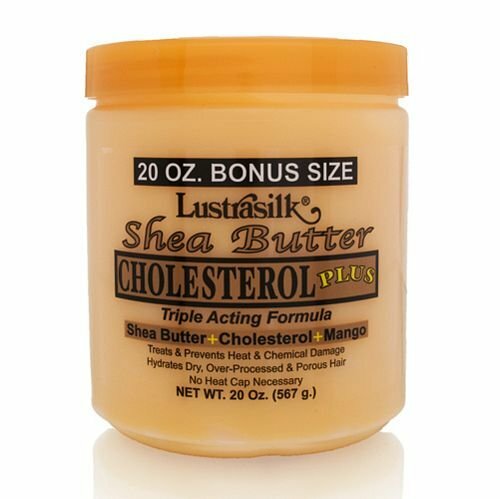 I’ve been using Lustrasilk Shea Butter Cholesterol PLUS for a while now. I have used this on both relaxed and natural hair with the same results. The first time I used this Shea Butter Cholesterol, I applied it to my lightly towel-blotted hair after I shampooed and then sat under a bonnet dryer for 20 minutes with a plastic processing cap. The results were mediocre at best. The product was SUPER watery, and even after I rinsed it out, I couldn’t see any marked difference in my hair. The second time, I applied the Cholesterol to my dry hair and sat under my bonnet dryer again for 20 minutes. I noticed a BIG difference (compared to my first-time use on wet hair). So, I would recommend using this as a deep conditioner on DRY or VERY LIGHTLY damp (not soaking or wet) hair. Is this the world’s best deep conditioner? Probably not. However, I don’t have any major complaints. I just wish this Cholesterol was thicker since I have fine hair. But, given the price, and the fact that this doesn’t contain any mineral oil, lanolin, or petroleum, I will definitely repurchase and use it as a base to add natural oils when I deep condition.